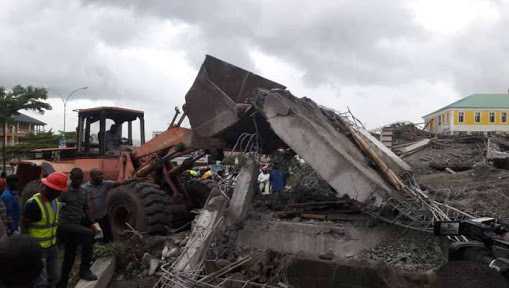 Two persons were killed and 20 others trapped after a four-storey uncompleted building collapsed unexpectedly yesterday at Jabi area of the FCT, Abuja. The building, which is opposite Panda Shopping Mall, gave way at about 1.30pm. Rescue workers were able to retrieve the corpses from the rubble a few hours after the incident yesterday. The building was affected by vibration and shrapnel during Boko Haram’s bombing of nearby Thisday Newspapers Office in 2012. Officials of the Federal Fire Service, National Emergency Management Agency (NEMA), National Security and Civil Defence Corps (NSCDC) and volunteers raced to the scene to lend the victims a helping hand. Once news of the building collapse hit the waves, a large crowd gathered round the area while vehicular traffic around the area also assumed a chaotic dimension. The situation was not helped by a downpour. Acting President Yemi Osinbajo was at the scene yesterday to assess the situation. He described the accident as unfortunate and said that all relevant public agencies had mobilized there for effective rescue. He commiserated with bereaved families and those injured during the collapse. He was accompanied by FCT Minister Muhammad Bello and the Secretary to the Government of the Federation, Mr. Boss Mustapha.